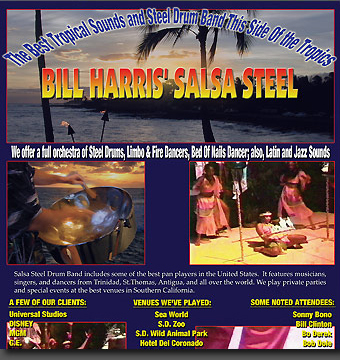 Salsa Steel Drum Band includes some of the best pan players in southern California. The band is located in San Diego. It features musicians, singers, and dancers from Trinidad, St.Thomas, Antigua, and all over the world. We play private parties and special events at the San Diego Zoo, Sea World, the Wild Animal Park, the Hotel Del Coronado, and many of the best venues in the San Diego area. We have had the privilege of playing parties attended by Bob Dole, Halle Berry, Steve Martim, N’Sync, Ophrah Winfrey, Fabio, Kareem Abdul Jabaar, and hired by Disney, MGM, Universal Studios, and many more.